Congratulations to the recipients of the Region 3 special awards and judges awards at the Region 3 Championships. The competition was jointly hosted by all clubs in the region and was held at Highland Park High School in Dallas, TX, May 19-20, 2018. The pair’s outstanding combined routine from World Championships qualifications was posted by USA Gymnastics on Facebook, and, through shares, has been viewed over 3.4 million times – and counting – by people all over the world, many of whom have never seen competitive acrobatics before. The band Distrubed, whose song they use for their combined routine, gave them a shout-out on social media and also reposted their routine on Instagram and Twitter, further spreading the beautiful sport of acrobatics to many more people across the globe. The pair came back from World Championships determined to continue their quest for World Cup and World Championship medals next season. They practice 5 days a week – somedays twice a day – totaling 27-30 hours per week. We are proud of their dedication, hard work, and accomplishments and feel they deserve to be named Region 3 Athletes of the Year! Ivan Ivanov was a very successful athlete, coach and judge in Bulgaria. His Bulgarian Champion Men’s Four took 12 medals at World Cup, World Championships and European Championships. 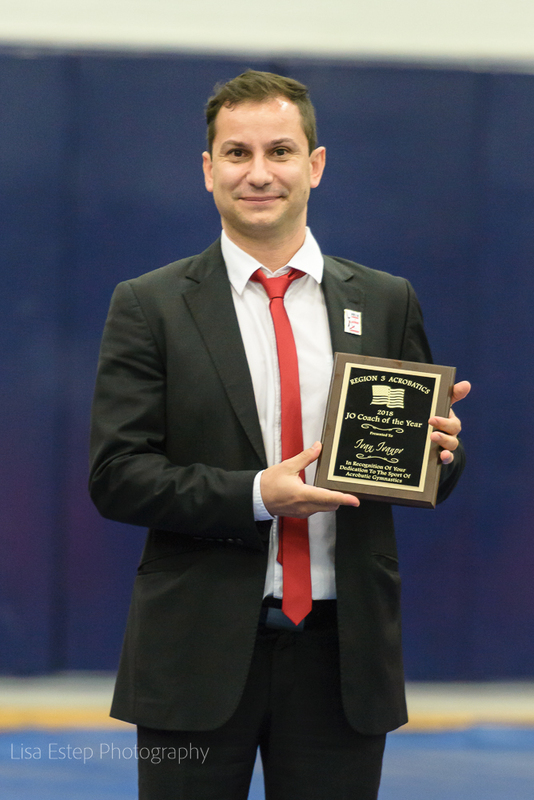 Ivan came to the US in 2015 and coached for Kilgore ACRO. 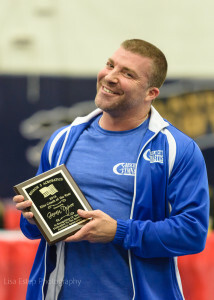 His JO athletes took 2 Gold, 1 Silver, and 1 Bronze at the 2015 US Nationals. He later moved to New Orleans and teamed up with NOLA Gymnastics. His NOLA JO athletes won 2 Gold, a Silver, and Bronze in 2016, and a Gold, Silver, and Bronze in 2017. 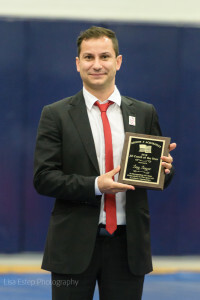 The Federation of International Gymnastics FIG has invited Ivan to be a judge at many World Cup and World Championships. His knowledge provides a valuable asset to our JO Program in the US. Jessica retired as a senior elite women’s pair base in 2017 but has continued to be involved in acro as a clinician, choreographer, and coach at WOGA. 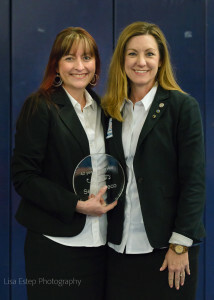 Brandi stepped in to the JO chair position for our region and has helped tremendously in preparing for regional championships and helping other region board members. 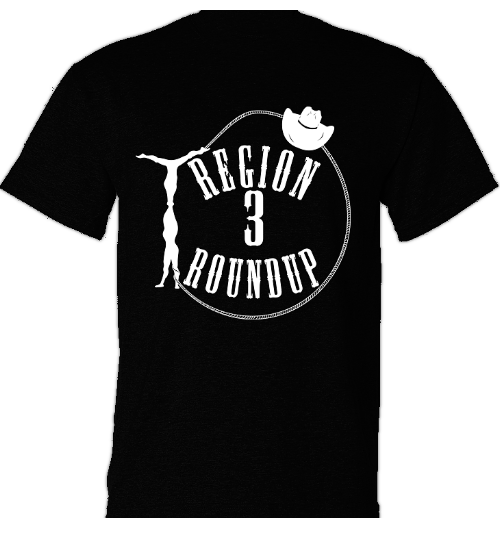 Brandi has also stepped up to be the meet director for Region 3 Championships and has done a great job organizing this event for our Region. Selena has worn many hats throughout her acro career – many at the same time! She’s been an athlete, coach, choreographer, parent of an athlete, administrator, volunteer and judge. 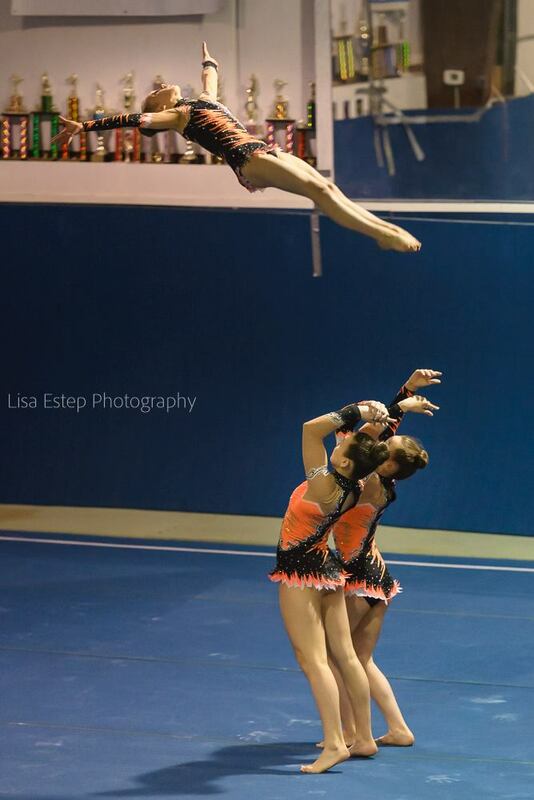 Selena started her team Fliptastics and year by year, grew her program from Level 5 up to Elite National Team Members. Her athletes were getting noticed due to her innovative choreography and original skill elements. It wasn’t long before Fliptastics was known on a national level as producing top athletes. Although Selena has had so many amazing accomplishments, I can safely say that having her daughter become an elite athlete and make the USA National Team was one of her most proud and memorable moments in her career. She enjoyed traveling to international competitions playing dual roles of coach and judge when needed. You could always count on Selena to do whatever was needed for Team USA to succeed. The hurricane was devastating not only for Fliptastics, but Selena personally. Somehow she managed to continue holding together her the team she held so dearly in her heart. Fliptastics was everything to Selena and she gave so much during those hard times to make sure that her kids could continue in the sport they loved. Selena stepped into the role as JO Chair on the Program Committee and played an important role in creating and developing the Junior Olympic Code of Points – one of the most time consuming jobs in acro. 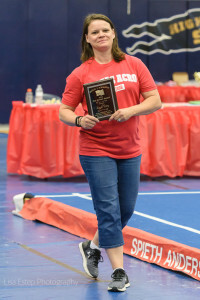 No one can even begin to count the amount of volunteer hours she has put in to our sport! As a judge Selena quickly moved up the levels of internationally ranked Brevet judges. She judged at countless international meets. Her knowledge and expertise made her a “go-to” person whenever there were questions about tariff sheets or international rules. Selena always had the right answers! There’s not enough time to accurately account for everything Selena has done for the sport of acrobatics in the USA. We want to truly thank and honor Selena for everything she has done over her 40 plus years in the sport! Former USA National Champion and FIG World Class Gymnast Beth Landeche has been busy since retiring from the sport in 2013. In the four years since her last Acro competition as a women’s pair with partner Nicole Barrilleaux, she has been relishing a new role — that of a college student. Landeche graduated in May with a degree in Film and Television from the Savannah College of Art and Design in Savannah, GA, and her senior project was a documentary short on the sport she loved since the age of 10: acrobatics. 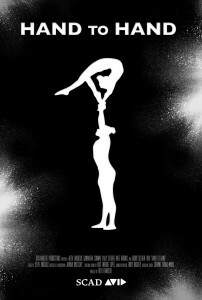 The documentary film follows two acro partnerships from her home gym, Crescent City Gymnastics (CCG) in New Orleans, LA. Samantha Conway & Lally Seither, a Jr Elite 13-19 women’s pair, and Nate Brooks & Brody Seither, a Jr Elite 12-18 men’s pair, are all junior national team members training under CCG head coach, Gawain Dupree. The film includes personal interviews with the athletes and glimpses into the training life of elite acrobats. Acrobatic Gymnastics, or acro for short, has been a gymnastics discipline in Europe since the early 20th century and was established in the United States in the 1970s. While not currently an Olympic sport, acro has been gaining notability with the general public thanks in part to groups like Acro Army, who were finalists on the 9th season of NBC’s America’s Got Talent. In 2018, acro will have it’s debut in the Youth Olympic Games, hopefully paving the way for the sport to one day achieve Olympic status. Landeche’s film, titled Hand to Hand, will debut in the Austin Spotlight Film Festival this month. It’s also been entered into the Louisiana International Film Festival, the TIFF Kids International Film Festival in Canada, the Nantucket Film Festival, and the Kew Gardens Film Festival later this year. Follow Hand to Hand An Acro Documentary on Facebook for the latest updates! Hand To Hand Trailer from Beth Landeche on Vimeo. They say luck is what happens when preparation meets opportunity. Such was the case for an acrobatic gymnastics pair from San Antonio, Texas, as they arrived in Wroclaw, Poland, for the 10th World Games. For non-Olympic sports such as acrobatics, the pinnacle of international competition is the World Games, held every four years in the year following the summer Olympics. The opportunity to compete in such an event is a rare one, indeed, and many factors must align for it to come to fruition. 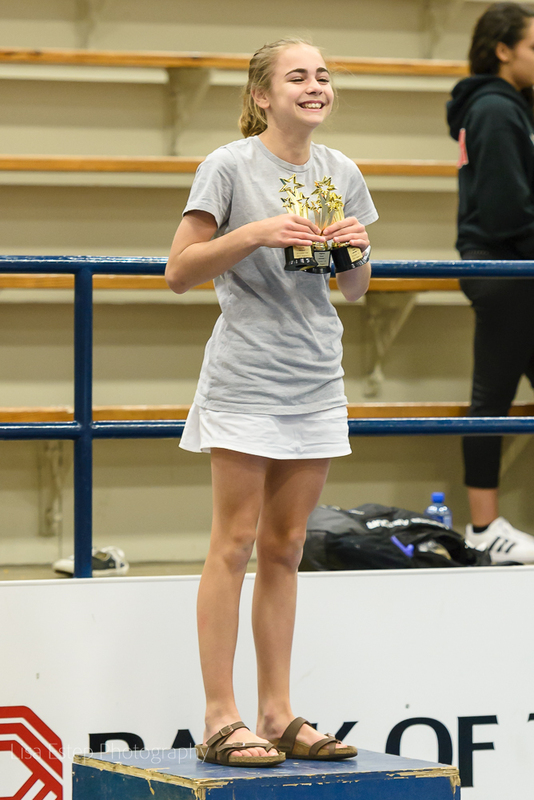 Just over a year before stepping onto the floor in Wroclaw, Emily Davis and Aubrey Rosilier were finishing up successful seasons in different partnerships. 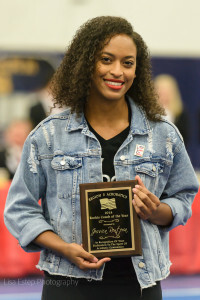 Davis won the gold medal with her partner, Rebekah Jones, in the level 10 women’s pair division at the 2016 USA Gymnastics Championships in Providence, RI. Rosilier, meanwhile, wrapped up a strong two year partnership with Thalia Berry by securing a fourth place finish in the Jr Elite 12-18 women’s pair category at the 2016 World Age Group Competition in Putian, China. In acrobatics, though, it is common for partnerships to change season to season as athletes outgrow each other or move in different directions, so both girls returned to the gym in June 2016 uncertain about what their acrobatic future would hold. Regrouping his team for the next two year cycle, Acrobatic Gymnastics of San Antonio (AGSA) Head Coach Vladimir Vladev had a vision for Davis and Rosilier, and it quickly took shape. The two picked up skills at a rapid pace and found that they had highly compatible personalities and approaches to training, which is critical in sport that has partners training together upwards of 30 hours per week. They set their sights on competing at the Jr Elite 13-19 level for the upcoming season, with a stretch goal of advancing to the Senior Elite level in time for the 2018 World Championships in Belgium. Those goals would quickly change. In March 2017, the retirement of fellow teammates Maren Merwarth and Jessica Renteria suddenly changed plans for Davis and Rosilier. 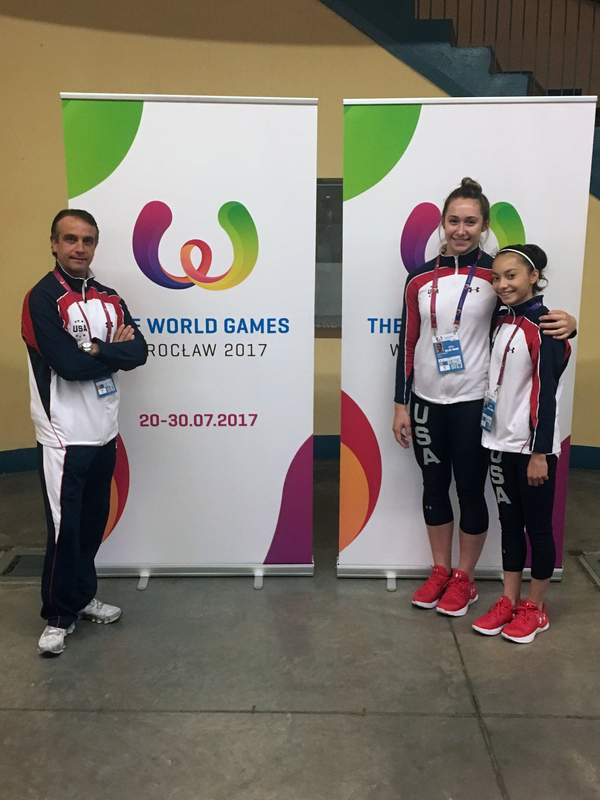 Merwarth and Renteria had earned the USA berth in the women’s pair division to the 10th World Games by virtue of their finish at the 2016 World Championships. With their retirement, the field for selection of a women’s pair to compete at the World Games was wide open. Davis and Rosilier, along with Vladev, adjusted their plans. 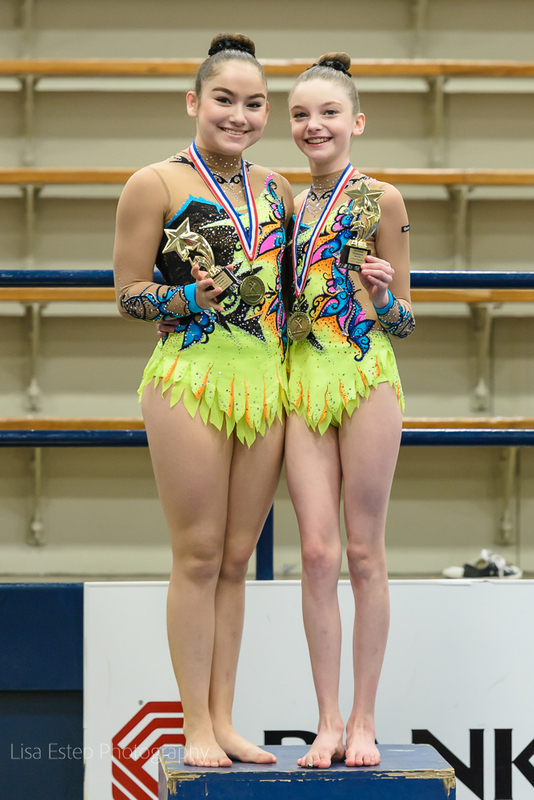 After competing their first international competition together at the Geneva Acro Cup in May (the first international competition ever for Davis) and winning silver in the Jr Elite 13-19 women’s pair division, the pair came home and switched gears. They learned a new routine, choreographed by World Champion and Acro Army creator Arthur Davis III, and increased their skill difficulty to Senior Elite level. 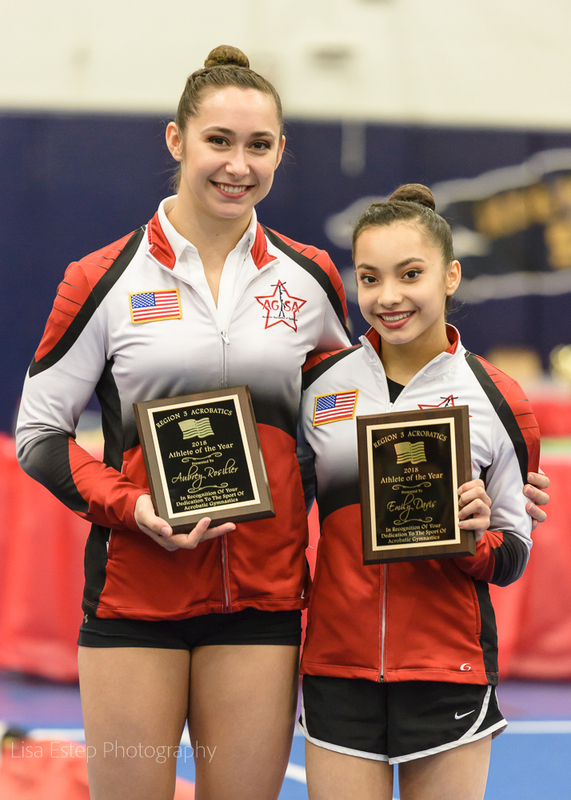 A month later, they competed their first Senior competition at the 2017 USA Gymnastics Championships in Milwaukee, WI, winning gold and being selected to represent the United States at the World Games. They immediately got back to work, meeting up with the rest of Team USA in California for a pre-Games training camp and arriving in Wroclaw at the end of July. The competition in Wroclaw was intense, with top women’s pairs from around the world vying for one of only four spots in the finals. Davis and Rosilier had the “luck” of drawing the first spot in the first rotation, opening the Games with their stunning new routine to the classic Sound of Silence. After the second round of routines, they held on to third place and advanced to the finals, something that seemed quite a long shot a few months before. The unusual competition format, which called for all three routines to be competed in one day, was grueling but the pair kept up the pace, finishing in fourth place after the finals, the highest finish ever for a USA women’s pair at the World Games. What did the girls think about this whirlwind of a year? “Being chosen to represent the U.S. at the World Games was a very exciting experience. However, it was very tough to progress so quickly in one year, from being level 10 to competing as senior elite. 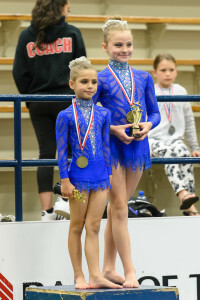 It definitely took a lot of dedication and a lot of hours spent practicing in the gym,” said Emily. Aubrey, too, expressed excitement over the once-in-a-lifetime opportunity. “I feel blessed to have been able to compete for the USA on such a big stage, and I hope that we honored Maren and Jessica’s legacy with a strong performance.” The girls both credit their coach for keeping them focused and prepared both mentally and physically. Up next for the pair is the Pan American Championships in Daytona Beach, FL, Oct 13-15, 2017, followed by World Team trials at the National Team Training Center in Huntsville, TX in February. Their stretch goal of competing at the 2018 World Championships in Belgium is definitely within reach, and they are determined to bring home some hardware.